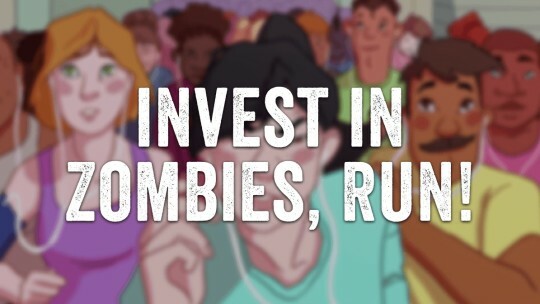 Invest in Zombies, Run! – Zombies, Run! We have big plans for the future of Zombies, Run! and virtual races. By investing in Six to Start, you could help make them happen and share in our future successes. To help fuel that growth, we’ve launched a crowdfunding campaign on Crowdcube. So if you’d like to own a piece of Six to Start and share in our future successes, you can buy shares from as little as £10. Anyone in the world (excepting the US, Canada, and Japan*) can invest. Zombies, Run! was built with your support. Back in 2011, this game was originally funded on Kickstarter by 3500 backers, and since then, we’ve been blown away by how much it’s changed people’s lives around the world – from beginners running their first 5k, to veteran marathoners who’ve run thousands of kilometers. We want to keep improving Zombies, Run! so that it can help motivate and entertain millions more runners, and we want to stay ahead of the latest technology and trends, like wearable devices and virtual races. So you won’t just be helping us make the great apps you love; you’ll be helping even more people get fit, escape zombies and become heroes, just like you. *We really wanted to open this up to everyone in the world, but there are strict laws against us accepting crowdfunding investment from these countries! Next Post Season 6 is here!